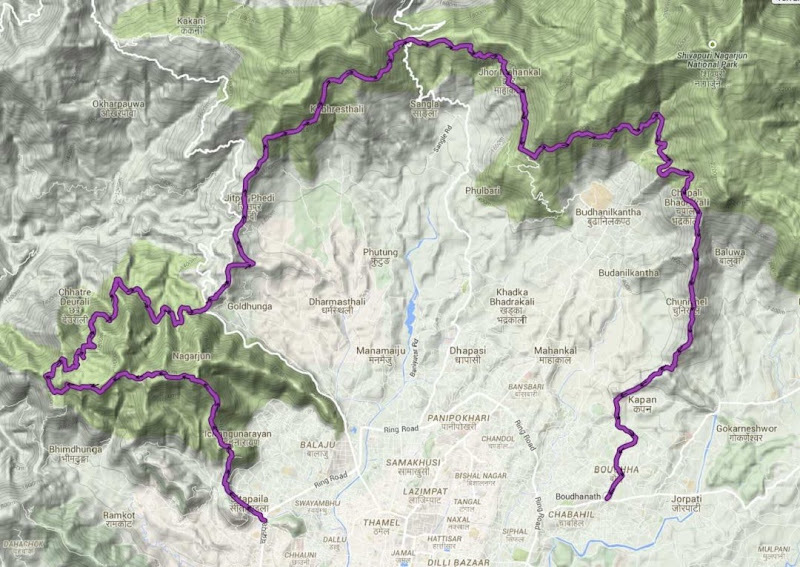 – 54 km ultramarathon running mainly along the paths of tourist paths. The route connects the two most important Buddhist temples in Nepal and several Buddhist monasteries. This year’s run to 41 km was led by Roman Evarts from Lithuania. Then he lost the route and eventually reached the finish line with time 8:44:31. The run was won by nineteen-year-old Sunamaya Budha from Nepal reaching the Bouddh stupa during 5:36:29. ‘Sunamaya has a great running style, she just flies,’ said Roman Evarts. Below are some details from the run, photos below. Ultramarathon on the 54 km route began almost planned – at 6:14. 72 runners took off from the Swayambhu temple, 69 people finished the race in 12 hours. The trail runs between two large stupas that are for many valuable cult objects and a world heritage of ancient culture approved by UNESCO. An extremely inspiring, highly aesthetic experience, and at the same time requiring a gentle, regular effort. The route is about 53 km. It is dominated by forest paths, 20% of the route includes a packed road, and 5% is asphalt or similar surface. It includes 6 control points plus a point at the finish. Start at 6.00 am at the Swayambunath stupa. The route is well marked with orange or pink fluorescent ribbons. It can be easily completed in a constant 5 km rhythm of the march and be in the finish for up to 12 hours. The ending – 6.00 in the evening, this time is dark. The start is planned at 5:30 at Stupa Swayambhu. Immediately 7 km of the hardest and the only serious climbing day at Jamacho Gumba. Then a long way down through Nagarjun Jungle – about 13 km to Mudhu. You continue along the 3 km ridge from Mudkh to Tinpiple. You have 8 km to the next point. Now climbing to Tarkeshwor Mandir to welcome Sadhu who lives there. Continuing, you pass the military camp and run to Gurje Bhanjyang. Here is a tap with clean water. Hence a 5.5 km rocky road to Dandagaon. Continue along the narrow path and then the rocky road to Nagi Gumba – 8 km. From Nagi Gumba you run 7 km down the ridge to Kopan Gumba. The last 2.5 km goes through a dusty road, where traffic can be big. From the Bouddha stupa you can easily reach by minibus or taxi to any part of the city. For runners there is information about the possibility of departing from the route at each of the five points. The buy-in amount is comparable with similar runs in Asia, for example in Hong Kong. Fees are higher for foreigners, thanks to which we can maximize the share of locals, providing some of them with subsidized places. Thanks to the fact that we can maximize participation, we promote sport in Nepal, which for many is a great opportunity to draw their family out of poverty. Perhaps in this way we will be able to find new world champions. Nepalese people living in the high regions of the country are regional natural born runners. The entry fee does not include beer at the end – take your money to this end! You can organize it easily. Swayambhunath is an easily accessible place, because it is not far from the beltway, just a dozen minutes by taxi from Thamel. There are many hotels around the Swayambhu hill, and you can also find accommodation for long time in student prices.